For those of us who are always on the run, finding time to exercise can be a challenge. While work, school and day-to-day stresses are a part of life, it can be tough to climb out of bed early and hit the gym; or prioritize an evening yoga class after a long day. I often hear patients in my integrative medicine clinic complain about being too tired to work out or unable to squeeze gym time into their hectic schedules. I always remind my patients that exercise doesn’t just happen in a gym, nor does it require the “right” workout clothes or shoes. Exercise can take place at any time of the day, as long as you’re open to changing up your regular routine and getting creative with it. 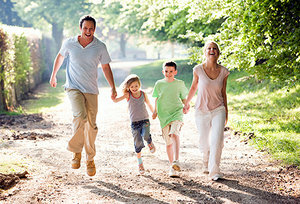 Even a few extra minutes of movement per day promotes blood flow and will affect your energy levels and mood. Here are five tips on incorporating daily movement into your life in ways that are both practical and enjoyable. 1. Shake It Out: The next time you’re watching TV, challenge yourself to do jumping jacks during a commercial break. Mute your TV and put on your favorite music, do as many push-ups or sit-ups as you can, dance around, or even just jump in place. Worry less about doing the moves wrong and more on enjoying yourself. There is no wrong way to move! 2. Count Your Steps: Try taking the stairs instead of riding the elevator when you get the chance, especially if you’re only going up or down a few floors. If you work in a building with many floors, hop off the elevator a few floors before your own and walk the rest of the way up/down. 3. Stop and Smell the Roses: Instead of driving somewhere to grab lunch, go green and walk to a nearby café or restaurant. If you bring your lunch with you, don’t settle for sitting inside a cafeteria – briskly walk to the nearest park or green space and enjoy your lunch outdoors. Not only will you get your daily requirement of vitamin D, but you’ll also have the energy to power through the rest of your workday. 4. Change Your Pace: If you’re the type who circles around the shopping mall looking for the closest parking spot, switch up your routine and get in the habit of parking far away. Not only will you find a spot with ease, but you’ll also get a workout, particularly if you’re toting shopping bags. 5. Back to Basics: If getting to the gym is deterring you from working out, remember exercise is literally around the corner. Whether you live in the middle of the city or out in the suburbs, taking a stroll around the block only requires you to put shoes on and walk out the door. Put on your favorite playlist or podcast and set a timer if you’re short on time, and remember: You can be active anywhere as long as you prioritize it in your daily schedule.